Providing your customers with convenient and private payments is a necessity. Our point of sale PIN pads ensures you take your processing to the next level. At Pivotal Payments, our superior credit card machines combine state-of-the-art technology, PCI-PED compliance and advanced features, in one simple to use and affordable package. Select from industry-leading models from Ingenico and Verifone. With multiple connectivity options and configurations, we have everything you need in a PIN pad, for now and in preparation for the future of payments. Designed with clerk-customer interaction in mind, all of our PIN pads feature a bright, vivid display and easy, menu-driven terminal prompts to make PIN entry and option selection virtually effortless. To select your perfect PIN pad, click here to get in touch or call us at 1-877-462-7486. Built around Ingenico's industry-proven, highly secure core, the iPP220 is a point of sale PIN pad that enables retailers to accept credit and debit card with fast, secure payment processing. 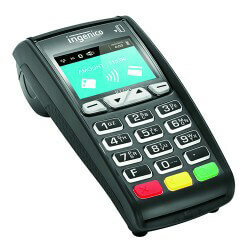 The Ingenico iPP320 is among the easiest-to-install terminal PIN pads on the market, in an elegant, customer-facing design. In addition to accepting EMV chip cards, magstripe, and NFC/contactless payments, the iPP 300 Series also supports new technologies such as mobile wallets (Apple Pay and Android Pay). 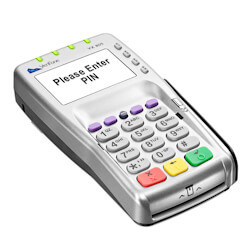 Verifone's PINpad 1000SE is one powerful device that offers enhanced functionality and a revamped ergononmic design. This best-selling favorite comes with a durable, reliuable PIN pad for secure PIN-based transactions. All with a large, graphic display to enhance consumer interaction. It's simple. It's secure. It's the PIN pad solution that fits every payment environment. 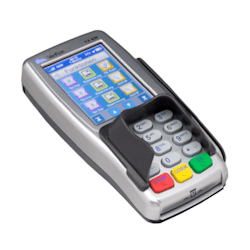 VeriFone’s VX 805 PIN pad delivers reliability, usability and next-generation NFC capabilities, all in one amazingly convenient payment device. The VX 805 allows merchants to process a variety of transactions – with multiple connectivity options – while providing cutting edge NFC technology for mobile payments. Ideal for large or small retailers, the VX 805 offers excellent value with full functionality and rock-solid reliability. Put the power, security and reliability of the VX Evolution platform at consumers’ fingertips. The VX 820 PIN pad is incredibly easy to use, convenient and readable in any environment. With limitless capabilities and a sleek, stylish design, the VX 820 works hard for your business. Our innovative service allows international customers to see the exact amount their card will be charged, expressed in their home country's currency.